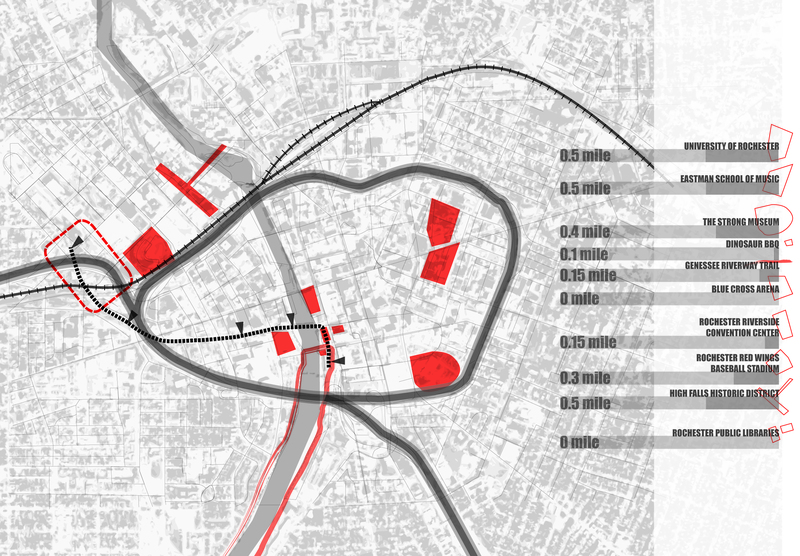 In the diagram above, I’ve identified some downtown attractions [seen in red] and they are all located within, a very walkable, 1/2 mile of the tunnel [dotted line]. I propose to re-purpose the abandoned tunnel as a distribution spine for not only bringing and dispersing people into the city, but also creating public gathering spaces such as places for events seen in the example from last year’s World Canal Conference. In other words, how could we make it an integral part of Rochester’s civic life? We don’t want a corridor, but a series of places where people have the opportunity to linger and connect to the rest of the city. 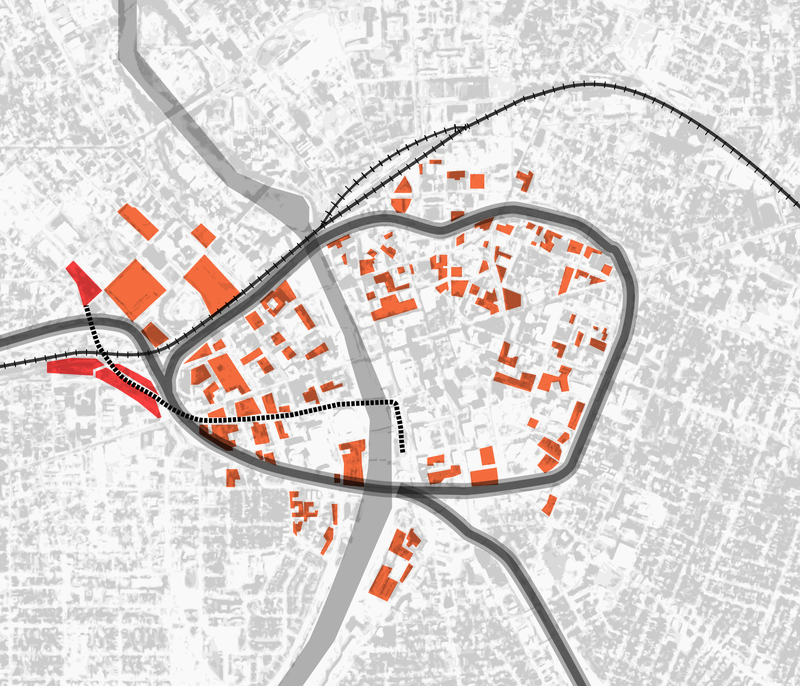 This early diagram illustrates the abundance of parking lots and some vacant lots throughout downtown. They are the result of the strong single occupant car culture of today. How can we rethink this transportation structure and change the perception of these parking spaces as potential opportunities to engage the larger network of transit and civic life. Are there specific places [i.e. the public library] in downtown that the tunnel could connect to because of its proximity? The above diagram is in its early stages, but begins to show a set of physical conditions of network intersections found along the western portion of the tunnel. To the left are potential actions that could take place given the type of intersection. 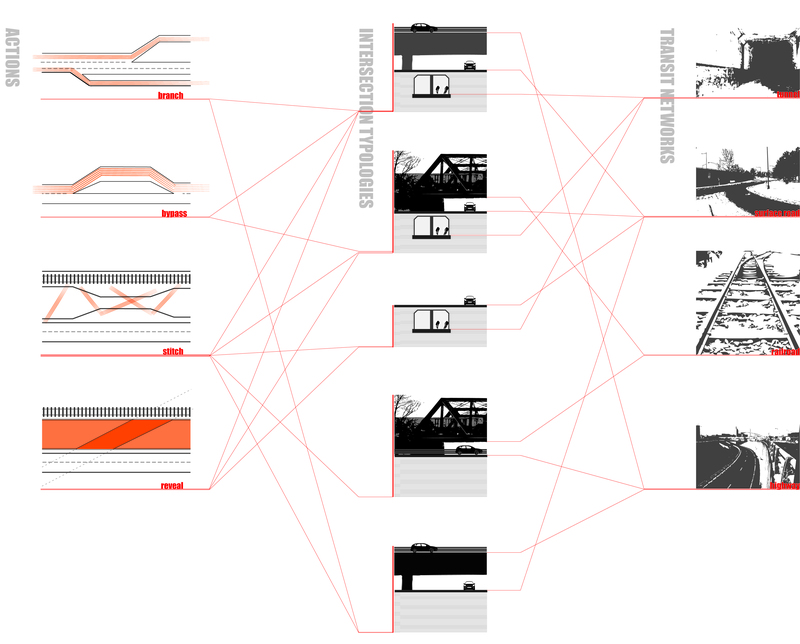 After the identifying the moments of connections along the tunnel, I will need to develop spatial and operational models for interchanges that transfer people from one mode of transit to another. Are they stairs, ramps, elevators, or any other means? 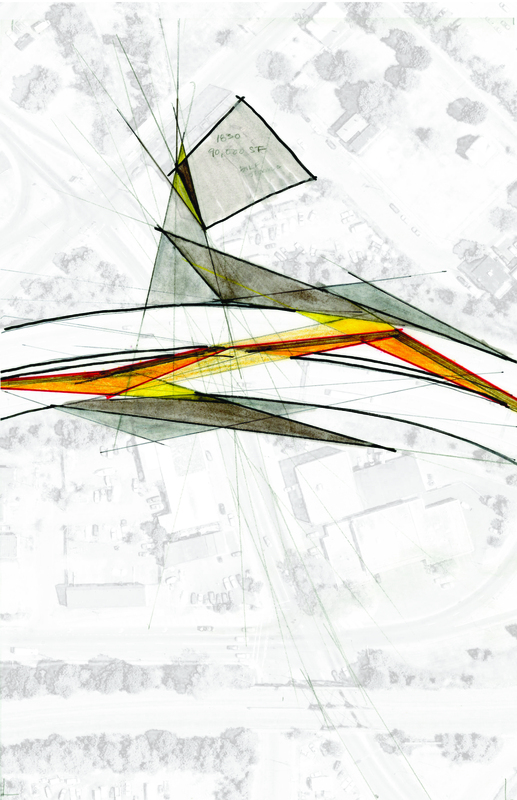 The intersections will then become a series of prototypical hubs responses to found conditions, but when read together, begins to weave a larger idea of the city and how people traverse through and interact with it. This kit-of-parts approach allows for flexibility within the systems even though there would be a couple of unique moments for anchors or special attractions along the spine. 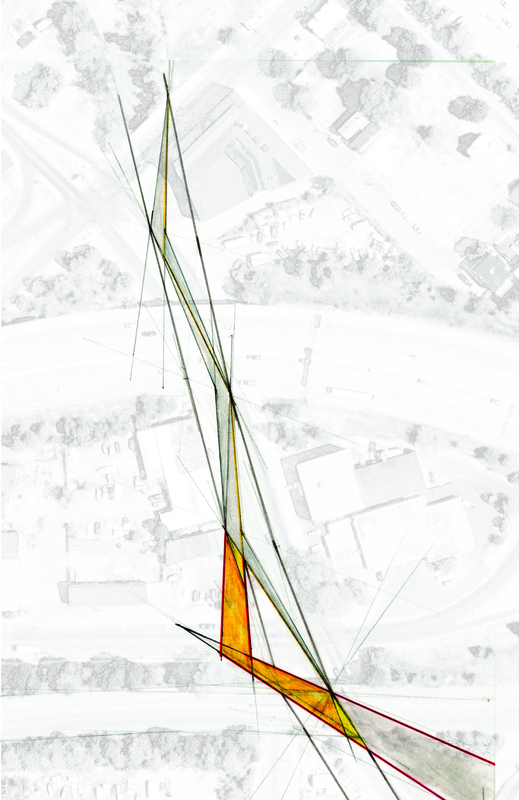 In addition to the conceptual development [or abstract, as seen above] of connecting the various transit networks, there is the realistic and almost scientific side to this project. That involves the differentiation between networks because of the inherent qualities of travel speed, transit type and transit goal of each system. How do the connections reflect these characteristics? What other operational programs are needed at these moments? There is much work to be done and it will be an exciting and fast-paced month ahead.